SUNNY COUNTRY’S SECRET SANTA IS OUT AND ABOUT AND LOOKING FOR YOU! SANTA HAS $250 VISA GIFT CARDS FROM CARSTAR CITY MOTORS COLLISON IN SANTA MARIA. SO HOW DO YOU GET ONE? JUST BE A GOOD HUMAN. IF WE SPOT YOU EXHIBITING A RANDOM ACT OF KINDNESS WE MIGHT REWARD YOU WITH $250 BUCK ON THE SPOT! SO BE GOOD THIS HOLIDAY SEASON AND MAYBE YOU CAN WIN! 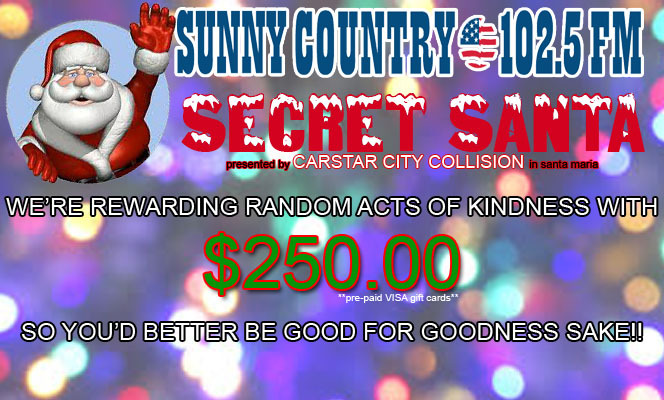 THE SUNNY COUNTRY SECRET SANTA… FROM CARSTAR CITY COLLISION IN SANTA MARIA!